Last time we talked about the idiom “to get over it”. When someone tells you to get over something or someone, they really mean “Don’t let the past ruin your life” or “It’s time to move on”. Today, let’s focus on this verb “ruin”. To ruin means to spoil, destroy or damage something severely or completely. For example, if you drink too much, you can lose your health. You can lose your job. You can lose your money. You can lose your friends or marriage. 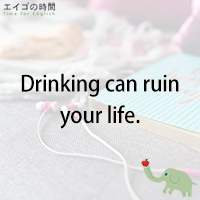 You can “ruin” yourself by too much drinking. Now, when it comes to the word “ruin”, good examples are offered by Vocabulary.com. Let me share them with you. Bad news always ruins your day and a guest’s bad behavior can really ruin a party and all your fun! Be careful when adding salt to your food — too much will ruin it. Now, would you like to try a quiz? You’ll be given three options. Please listen carefully and choose the one that is TRUE. Ready?